When it comes to increasing muscle size and definition, choosing the proper diet and exercise plan can be discouraging. What foods should you eat? What sources of protein are the best and how much should your daily protein intake be? All are very good questions that deserve an answer. So follow along, as you learn the best way to build solid, lean muscle and the kinds of protein that work best to help you achieve your desired fitness goals. The human body craves protein in order to survive. It’s an essential nutrient that allows our bodies to build strong muscles, bones, skin and cells. Since our bodies don’t store protein the way it does for carbohydrates, it’s vital that we develop a diet plan that makes sure we intake enough protein each day. According to Alexa Schmitt, RD, a clinical nutritionist at Massachusetts General Hospital, says that what makes a type of protein good or bad, depends on its saturated fat content. Proteins that tend to be high in saturated fat can raise your cholesterol level, which increases your risk of developing heart disease. As it stands, most Americans consume more than enough protein through their daily diets, but are they choosing the ‘good’ protein or the ‘bad’? Improve your protein. A great way to make sure your ingesting the healthiest types of protein is by exchanging those slabs of red and processed meats for other types of protein-rich foods like beans, nuts, tofu, fish, chicken, or eggs. Also, try exchanging the traditional beef burger for a turkey or black bean burger. It doesn’t sound as appetizing, but you’ll be surprised how tasty these substitutes can be. Don’t stress about quantity. As mentioned before, most diets contain a sufficient amount of protein, so focus more on quality than quantity. For example, eat an egg for breakfast, or top your salad with bits of turkey or beans. Simple changes in your diet regimen can make for a healthier and heartier meal. Lean meats. For many individuals, eating meat at least once a week is an essential part of being a full-blooded American. So, if you must indulge, look for leaner cuts of meat the next time you’re at the grocery store. Chicken, fish, turkey and beef that is ’95 percent’ lean are still high in protein, but contain less saturated fats. Soy. Schmitt recommends soy proteins like edamames (soybeans) and vegetarian meat substitutes like soy nuggets and veggie burgers. If you’re a person who wants to try and muster up the will power to forgo meat for a while, but you’re unwilling to quench your appetite with met alternatives, then try your hand at incorporating a daily protein shake into your diet. Now, if you’ve ever been to a nutrition store like GNC or a vitamin shop – or even strolled down the nutrition and supplement aisle at Walmart or Target – then you’ve probably encountered the wide variety of protein powders the world has to offer. 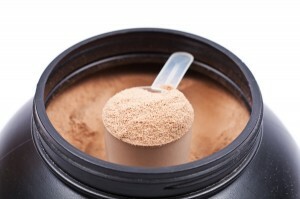 However, it can be difficult to decipher between which protein powders are the best. According to the National Institutes of Health, the most common – and the cheapest – type of protein powder is whey protein. Whey protein contains an array of vitamins and minerals and has been a vital post-workout commodity for professional athletes and recreational gym-goers alike. Whey protein has shown to repair muscles during post-strength session, while increasing muscle strength and size when consumed within two hours of your workout. In many ways, casein protein is very similar to whey protein. Like whey, casein comes from dairy, and is found in cow’s milk. However, unlike whey, casein digests at a much slower rate due to the interaction with certain stomach acids. Depending on your activity levels, St. Pierre recommends taking 0.6 to 0.9 grams of protein per pound of bodyweight each day. Any more than that, and your body will wind up storing it as fat.